, an ingenious French mechanic, was born in Normandy the last day of August, 1663. His father having removed to Paris, William received the first part of his education in this city. He was in the third form of the Latin school, when, after a considerable illness, he contracted such a deafness as obliged him to renounce almost all conversation with mankind. In this situation he began to think of employing himself in the invention of machines: he applied therefore to the study of geometry; and it is said, that he would not try any remedy to cure his deafness, either because he thought it incurable, or because it increased his attention. He studied also the arts of drawing, of surveying lands, and of building, and in a short time he endeavoured to acquire a knowledge of those more sublime laws which regulate the universe. He studied with great care the nature of barometers and thermometers; and, in 1687, he presented a new hygroscope to the royal academy of sciences, which was tery much approved. 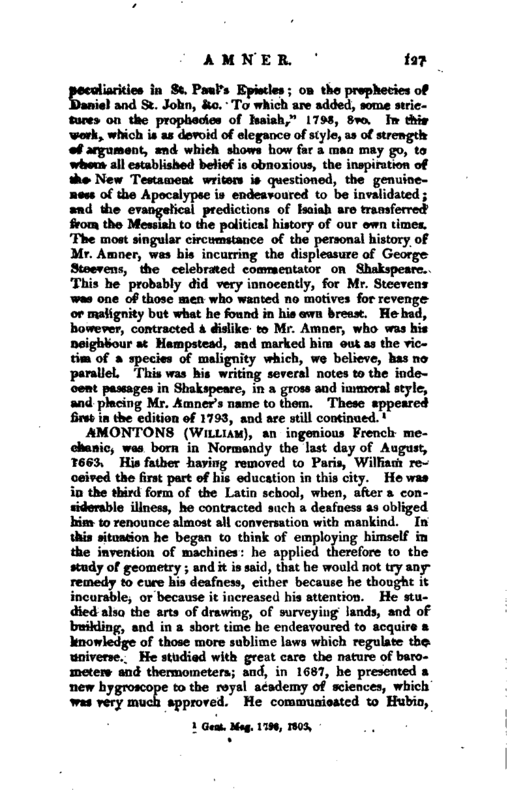 He communicated to Hubin, | a famous enameller, some thoughts he had conceived, concerning new barometers and thermometers; but Hubin had anticipated him in some of his thoughts, and did not much regard the rest, till he made a voyage into England, where the same thoughts were mentioned to him by some fellows of the Royal Society. 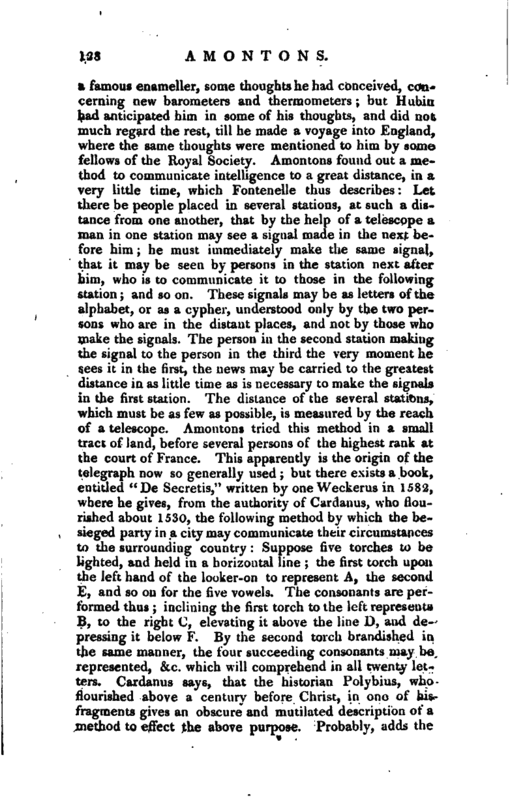 Amontons found out a method to communicate intelligence to a great distance, in a very little time, which Fontenelle thus describes: Let there be people placed in several stations, at such a distance from one another, that by the help of a telescope a man in one station may see a signal made in the next before him; he must immediately make the same signal, that it may be seen by persons in the station next after him, who is to communicate it to those in the following station; and so on. These signals may be as letters of the alphabet, or as a cypher, understood only by the two persons who are in the distant places, and not by those Who make the signals. The person in the second station making the signal to the person in the third the very moment he sees it in the first, the news may be carried to the greatest distance in as little time as is necessary to make the signals in the first station. The distance of the several stations, which must be as few as possible, is measured by the reach of a telescope. Amontons tried this method in a small tract of land, before several persons of the highest rank at the court of France. This apparently is the origin of the telegraph now so generally used; but there exists a book, entitled “De Secretis,” written by one Weckerus in 1582, where he gives, from the authority of Cardanus, who flourished about 1530, the following method by which the besieged party in a city may communicate their circumstances to the surrounding country: Suppose five torches to be lighted, and held in a horizontal line; the first torch upon the left hand of the looker-on to represent A, the second E, and so on for the five vowels. The consonants are performed thus; inclining the first torch to the left represents B, to the right C 3 elevating it above the line D, and depressing it below F. By the second torch brandished in the same manner, the four succeeding consonants may be represented, &c. which will comprehend in all twenty letters. Cardanus says, that the historian Polybius, who flourished above a century before Christ, in one of his fragments gives an obscure and mutilated description of a method to effect the above purpose. 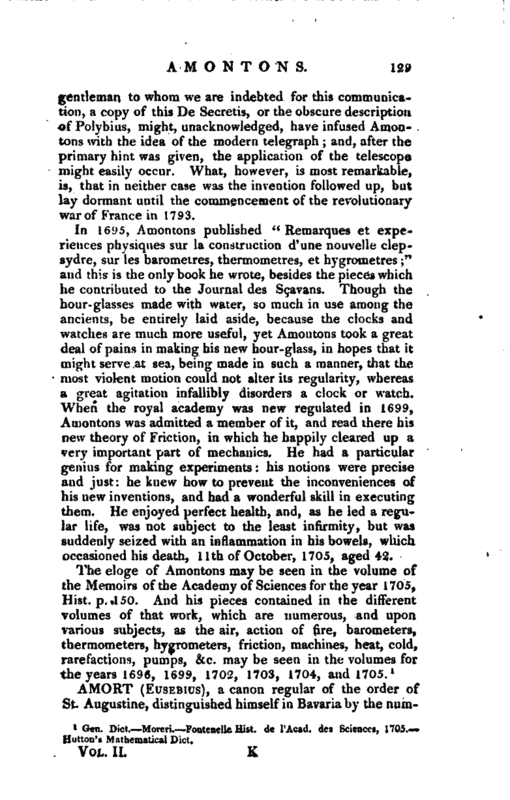 Probably, adds the | gentleman to whom we are indebted for this communication, a copy of this De Secretis, or the obscure description of Polybius, mi^ht, unacknowledged, have infused Atnontons with the idea of the modern telegraph; and, after the primary hint was given, the application of the telescope might easily occur. What, however, is most remarkable, is, that in neither case was the invention followed up, but lay dormant until the commencement of the revolutionary war of France in 1793. In 1695, Amontons published “Remarques et experiences physiques sur la construction d’une nouvelle clepsydre, sur les barometres, thermometres, et hygrometres;” and this is the only book he wrote, besides the pieces which he contributed to the Journal des Scavans. Though the hour-glasses made with water, so much in use among the ancients, be entirely laid aside, because the clocks and watches are much more useful, yet Amontons took a great deal of pains in making his new hour-glass, in hopes that it might serve at sea, being made in such a manner, that the most violent motion could not alter its regularity, whereas a great agitation infallibly disorders a clock or watch, When the royal academy was new regulated in 1699, Amontons was admitted a member of it, and read there his new theory of Friction, in which he happily cleared up a very important part of mechanics. He had a particular genius for making experiments: his notions were precise and just: he knew how to prevent the inconveniences of his new inventions, and had a wonderful skill in executing them. He enjoyed perfect health, and, as he led a regular life, was not subject to the least infirmity, but was suddenly seized with an inflammation in his bowels, which occasioned his death, llth of October, 1705, aged 42. Gen. Dict.—Moreri.—Fontenelle Hist, de l’Acad. des Sciences, 1705.—Hutton’s Mathematical Dict.